We supply elephant Chain pulley block these products are designed for heavy duty use for all Industrial applications. 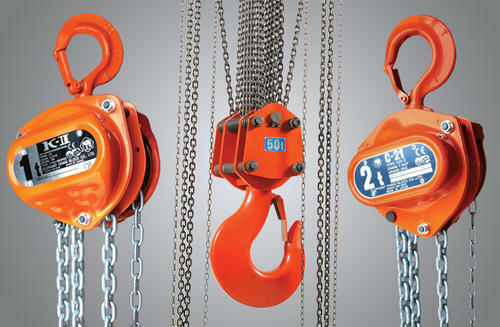 It is designed keeping in mind to be reliable, durable and withstanding your Heavy Industrial needs. A lightweight design – the 1 ton unit with 10’ lift weighs 27 lbs. Reliance Hardware Mart incoprporated in 1949 by Mr.abbas bhai jodhppurwaala. Through the past seven decades, the company has maintained financial and technical collaboration with different material suppliers and vendors, and the amalgam has contributed immense to its infrastructural development. Though we are primarily based in Chennai, our reach pans across the length and width of the country. We have regional posts in all the major metropolises of India. As for the cities that have recently come up as important centers of trade like Ahmedabad and Bengaluru, we have our representatives catering to those. Today, we have over a 100 marketing associates working with us from all corners of the country, and that has kept our business network proliferating continuously. Using the time and reputation, we have also managed to build a remarkable base of sub-dealers who supply our patented products to different sectors of the market. Through their sales point, our products reach millions of buyers that we cannot access directly due to the obvious limitations of time and distance. What helped us in our march through time is our EN standard quality of products that have largely shaped our goodwill and dependable reputation in the market.